1)	Cut two pieces of copper wire (6 inches long). 2)	Use the princess frog (rubber) as the sensor. 4)	Did step 3 again on the other side of the leg and ensured the two pieces of copper wire don't touch. 5)	Connected the battery to the battery clip. 6)	Took the positive end of the multi-meter and connect it to the positive terminal of the battery with an alligator clip. 7)	Took one of the copper wires (sensor -princess frog and wrapped with copper wire), attach an alligator clip to it and the other end of the alligator clip and connected to the negative terminal of the battery. Took the negative end of the multi-meter and connect it to the sensor (other princess frog) with an alligator clip. 9)	The sensor (princess frog) was submersed in the drink sample and the results were recorded for each trial. And as I stated, still getting a reading of all drinks of 9.6. After diagramming your connections, they all seem to be correct. Usually this experiment uses a sensor made of an insulating plastic rod with the two windings. I don't know what your rubber "princess frog" is, but even if it appears to be rubber (usually an insulator) it might, in fact, be conductive. Make sure by using a high range on the ohmmeter scale of your multimeter to verify that there is no measurable resistance between the copper windings on the two frog legs. My second thought, if the frog is indeed a non-conductor, is to question how your meter range has been selected. It should be in the DCA (direct current amperes) and set to the 200 milliampere range. The negative, or black lead in the COM jack, and the positive (red) lead in the VΩM socket. 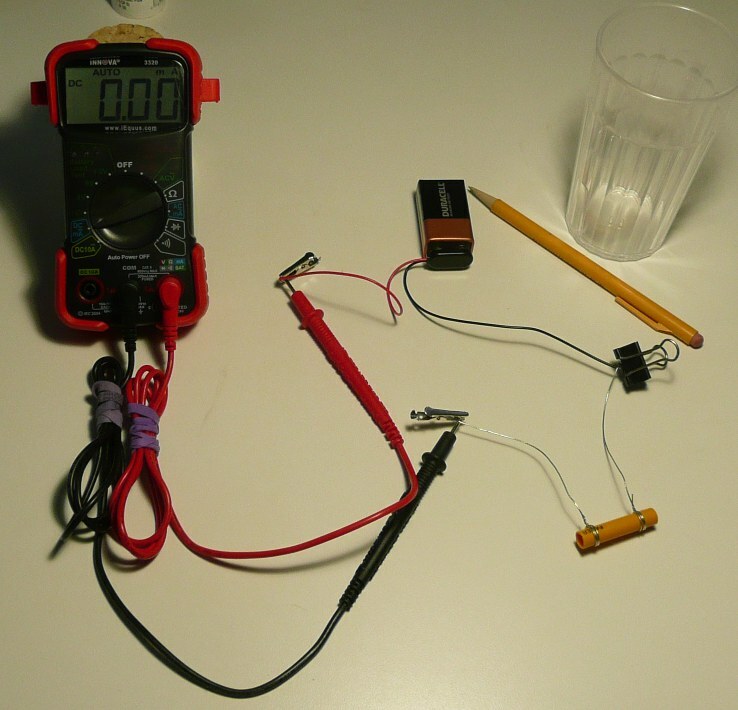 There also have been some reports on this experiment that some students found that the protective fuse in their multimeter had been blown. Another item to check. Good luck. There seems to be many unhappy experimenters doing the Electrolyte Challenge. Here are two pictures of the experimental setup that may be useful. 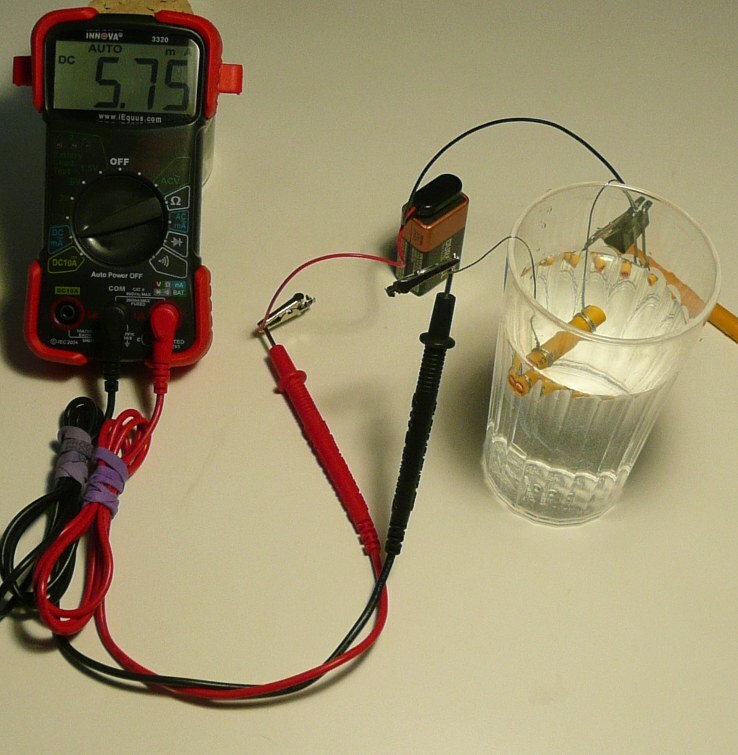 Figure 1: An example of the setup described in Figure 2 of Electrolyte Challenge. Note that the meter is set to "DC ma" and registers 0.00 ma because the sensor is in air. The sensor is made using copper wire wound on a piece of a plastic pencil barrel. I put a very small drop of "super glue" on each winding to hold it on the barrel securely. My copper wire has a tin coating, so it is silver colored. Bare copper works just the same. The clips are used simply to hold the connections together. Any sort of clip is okay. The rubber bands around the test wires are just to keep them out of the way. Be sure that the wire you use has no insulation on it. "Magnet wire" may look like bare copper , but it isn't bare.